Sony had a positive quarter three months ago but it's back in the red. The company actually posted increased sales of $17.45 billion (up 7.2% on a yearly basis) in large part thanks to strong PlayStation sales and strong performance of Sony's image sensor business. The company did take a hit in sales after parting with its computer business, though. The end result for the quarter is a consolidated operating loss of $785 million compared to an operating profit of $124 million in the same quarter last year. Still, the loss is about half of what some analysts expected. The "significant deterioration" is to a hefty impairment charge to the tune of $1.6 billion due to the newly formed Mobile Communications segment, which was split off from the computer business. This unit recorded a slight increase in sales but took a massive operating loss. 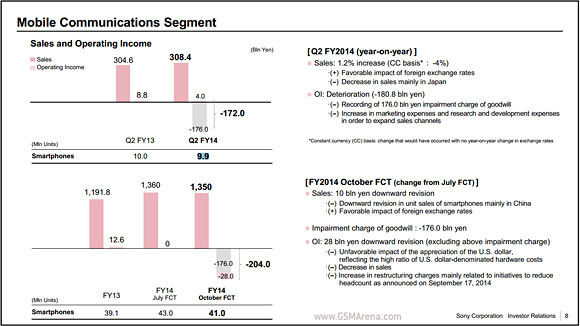 Sony shipped 9.9 million smartphones this quarter, a minor decrease compared to the 10 million a year ago. The company lowered its full-year prediction from 43 million to 41 million sales, still above the 39 million it sold in 2013. The outgoing CFO said Sony will pull out of China (where locals like Xiaomi rule the market), while the incoming head of the mobile division will focus on improving relationships with carriers. The gaming division took in $2.8 billion in sales (up 83.2% year-on-year) but the operating profit worked out to just $200 million (last year the division posted a loss in the same quarter). Sony sold 3.3 million PlayStation 4 consoles during the quarter, increasing its lead over rival Microsoft. The division producing image sensors earned $2.3 billion in revenue and posted an operating profit of $271 million thanks to a higher demand of mobile phone cameras. Imaging products (Sony cameras) brought in an additional $1.6 billion in revenue and $184 million in operating income. The division is reporting a shift away from low-end cameras towards value-added models and a "significant" decrease in unit sales of digital cameras. The TV segment recorded $2.6 billion in sales and $73 million in operating profit (also recovering from a loss). A dropping average selling price was counted with a shift to higher-end models. 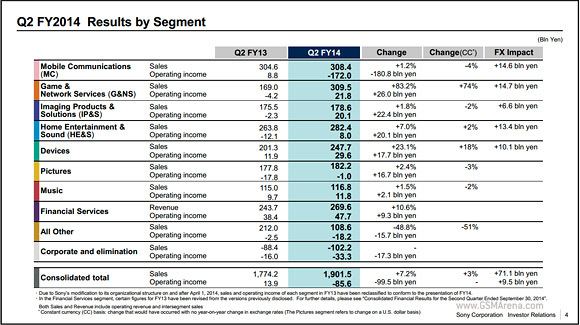 Financial services remain Sony's most profitable business with $437 million in operating income. You can see how Sony Pictures and Music did in the press release linked below.